There is an abundance of vegetarian restaurants in New York. If you are a vegetarian or vegan, you will be happy to know that we are a veggie friendly city. Most restaurants have vegetarian and vegan options on their menu due to the rapidly growing popularity of plant-based food, even amongst non-vegetarians. So, even if you’re not vegetarian, get out of your comfort zone and give it a try, it can be delicious! 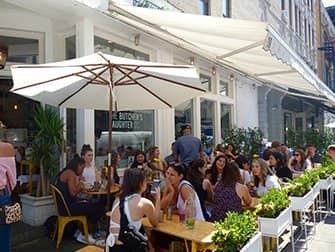 Because there are so many options, I have created a list with the best vegetarian restaurants in New York. If you are craving fast food while on a vegan diet, then head to By CHLOE. Try the Classic Burger (that can almost pass for the real thing… almost) and the Air-Baked French Fries. If you feel like something healthier, they also serve juices, smoothies and salads. They have a few small locations around the city. 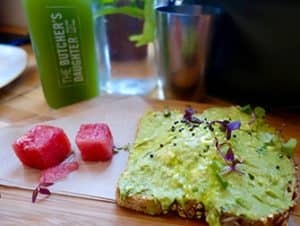 Contrary to what the name suggests, The Butcher’s Daughter is an all vegetarian and dairy-free restaurant. They describe themselves as a “vegetable slaughter house” and slow juices are their specialty. Why not try the “Goddess of Green”, a green juice with a twist? If you are more of a beer person, their selection of craft beers on tap won’t disappoint. Hungry? Choose among a variety of dishes like their famous avocado toast, a selection of “pastas” made with vegetables like courgette or a spicy kale salad, to name a few. They have two locations that fill up quickly during peak hours but the wait for a table is usually not too long. Candle 79 is a vegan restaurant on the Upper East Side. The organic menu is great and there are many options. They also serve gluten-free dishes, so this is a great spot if you’re looking for a gluten-free meal. The atmosphere in the restaurant is very good, if you are looking for a nice restaurant to eat with your partner, you can definitely have a nice evening here! There are also two Candle Cafe’s, one on the Upper East Side and one on the Upper West Side. Caravan of Dreams offers a wide range of dishes from all over the world: Mexico, Italy, Asia… there is something for everyone. Caravan of Dreams is located in the Lower East Side and attracts a younger crowd. On weekend nights there is often live music. I highly recommend trying their desserts, they are delicious. After dessert you can go out in this great neighbourhood. Vegetarian restaurant Sacred Chow is in a fun Downtown location. They have a varied seasonal menu so it is constantly changing. They serve salads, panini’s and also several sorts of tapas. One portion of tapas costs around $8 but you can also get 3 tapas for $19,50. Some dishes are nicer than others but the smoothies are all delicious. The atmosphere is not that great though and often there are long waits to get a table. Wild Ginger is an Asian vegan restaurant. The flavours and spices used in their dishes are amazing. All the main dishes can be served with rice, miso soup or a salad. The prices are very reasonable, the most expensive main dish costs around $14. This restaurant is located in SoHo though they do have another location in Brooklyn as well. Eric’s Tip: The atmosphere is nice, relaxed and the staff is helpful. Some spicy dishes can be made non-spicy, all you need to do is ask if it’s possible. Try the Cilantro Tofu and Pineapple Fried Rice.